The village of Cupramontana lies at 505 metres altitude and has beautiful views in all directions: valleys, mountains and the sea in the distance. With about 5000 inhabitants, Cupramontana is one of the larger villages in the area. There are several supermarkets, bakeries, shops and bars with terraces. Additionally, the village has a number of good restaurants serving delicious food at reasonable prices. Numerous festivals are held in Cupramontana and the surrounding villages throughout the summer, so there is always something to do. The most famous and oldest 'La Sagra dell'uva' is held in Cupramontana each year on the first weekend of October. For those who enjoy wine, there are several wineries, where you can sample wine and take a guided tour of the vineyard. Several historical sites are well worth a visit, for example the former monastry Eremo dei Frati Bianchi (white Friars) from the 12th century, the church of San Giacomo della Romita built before the 13th century but rebuilt in its present form in the 18th century and the restored abbey of Beato Angelo built in the 12th century. Other historic villages in the area are Staffolo and Cingoli. Cingoli is also known as the 'balcony of the Marches' because of the panoramic views across the Marches to the coast. In Jesi, a medieval walled city just 15km away, you can shop and visit the world famous Pergolesi Theatre. Here you can enjoy opera, ballet and classical music in an Italian atmosphere. Only 15 minutes drive away is the Regional Park "Gola della Rossa e di Frasassi". This is the green heart of Le Marche and the largest protected area in this region. Here you can explore the caves of Frasassi, a remarkable karst cave system, considered by many as the finest show caves in Europe. Accompanied by a guide (different languages), you can take a tour of these magnificent caves. Also in the regional park are several hiking trails that lead you along the sights of the park. Within an hour or so drive away, just across the Apennines are the towns of Spoleto, Gubbio and Perugia. Not forgetting the famous religious town of Assisi. Walks through these towns are certainly worth the effort. 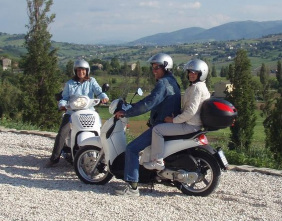 Rent an Italian scooter and discover the beautiful landscape! Maps and other information will be provided so you can find the most beautiful roads of Le Marche yourself withhout any problem. On request organised trips can be arranged. In Le Marche you will find everything the bikers adore. The hills of the Apenines turn slowly into rolling hills which go down to the Adriatic coast. There is no mass tourism and little traffic. This makes the area particularly suitable for all cycling enthusiasts. For mountain bikers especially it is a true paradise. There are not only trails for beginners, but also difficult technical single trails. The Adriatic coast is about 35km away and there are several beaches with umbrellas and sunbeds. To the south, just outside Ancona, is the National Park of Monte Conero. This park is located near one of the most beautiful coastlines on the Adriatic Sea. Over 20km you will find bays with pebble beaches, such as Porto Novo, Sirolo and Numana, where you can swim, sunbathe and sample the delicious fresh seafood. Senigallia, north of Ancona, is known for its long sandy beaches. About 10km from Cupramontana is Lake Castreccioni, also known as Lake Cingoli. The National Park of Monti Sibillini, a part of the Apenines, lies about 50km to the south. Nature, history and culture make this park a unique area. Species like the wolf, golden eagle, peregrine falcon and other native species also live here. Combined with historic villages and abbeys, which lie at the foot of the mountains, it would seem as if time had stood still. For those feeling more energetic there are many hiking and biking trails and a little further south there are also skiing opportunities.